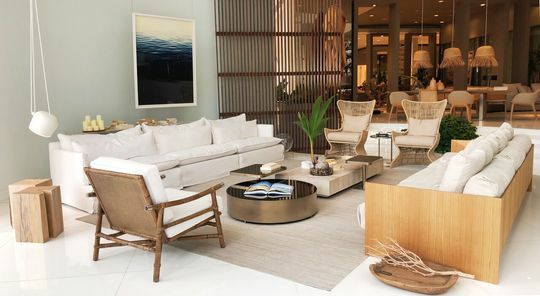 "An ode to the sea"
ARTEFACTO has invited ATELIER DE YAVORSKY to create a new atmosphere for its Coral Gables (Miami, FL) showroom. Guillermo de Yavorsky has created a space inspired by the natural Miami environment: the beach, a theme that fits the sleek style that Artefacto is known for. After living in St. Barth for ten years and now in Miami for the last four years, De Yavorsky has integrated his Caribbean experience to the Miami scene, and based his design on an essential element of the Caribbean: light. He imagined how it would fit within the space, and how he would recreate it in an organic way. In this project, ATELIER DE YAVORSKY doesn't deliver an overrated vision of the beach lifestyle in Miami. It's clearly the opposite: through a subtle selection of natural materials such as wood, the atelier translates a quiet atmosphere, slightly populated by the lush greenery installed by Andres Tabora. This initial natural concept was taken a step further with the addition of a faint aquamarine glaze, a prevalent color in Miami and a nod to the reflective nature of the sea. De Yavorsky also changed the color palette, choosing the perfect shade of white for a sofa that acts as the central point in the room, giving the space a fresh and relaxed atmosphere.